This home features hardwood floors throughout and ceramic tile floors in the kitchen and bath. The open floor plan and outside living space is great for entertaining or just relaxing with family and friends. Walking distance to First beach, Second Beach, restaurants and Newport attractions. See also listing 3493322 - Two homes on compound available for rent - perfect for reunion or wedding accommodations! House Details: 4 bedrooms, 2 full bathrooms. Hardwoods throughout and tile kitchen and bath. Furnished in summer - unfurnished or partially furnished in winter. Washer/Dryer. Outdoor shower with hot and cold water. Large fenced yard and patio area complete with picnic table and grill. Off - street Parking. Pets Negotiable. Full appliance kitchen. Utilities (included in summer - separate in winter): Efficient 2 Zone Gas Forced Hot Water Heat. Gas hot water, on demand (new water heating system Spring 2008). House wired for cable in most rooms. Area Details: Local Attractions: Blocks from Easton's/ First Beach. 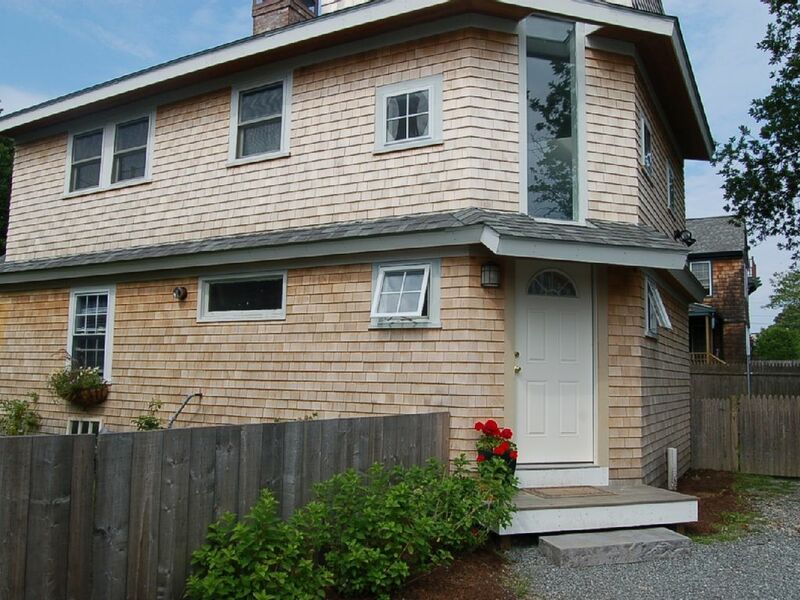 Minutes away from downtown Newport, and Cliff Walk (.5 mile) – walk or drive. 1 mile to 2nd Beach, Sachuest Point National Wildlife Refuge and Norman Bird Sanctuary. Walk to: Breakfast, lunch and dinner restaurants. Breakfast at the Atlantic Grill. Lunch at Flo’s Clam Shack. Convenience Store, Gas Station, Surf Shop. School and beach playgrounds. Minutes to Salve Regina University. 30 minute drive to URI and Providence - 20 minutes to RWU. Convenient to Naval Base. Awesome beach house! Great location! We had an amazing experience at this Home. Aimee was very easy to work with and accessible when we needed her. The location can’t be beat! 5 minute walk to the beach and a few restaurants, and a quick uber ride into downtown Newport. I would highly recommend for a girls weekend and would certainly stay here again! I was a little disappointed to be honest. When we arrived we were required to make all the beds. There were no sheets or blankets on any of the beds. The mattress covers were stained and had hair on them. Some of the blankets were even dirty. I've never stayed anywhere before where we had to make our own beds upon arrival. I tried to reach out to the homeowner privately about this matter but never received a response. Very sorry that this tenants was unhappy with the accommodations. We make every effort to ensure all linens are clean and stain free for each visitor. Most of the linens in the house were new this season and had been recently laundered. We do not discard perfectly good linens due to small stains after laundering. Sometimes static causes hair to stick to mattress covers in the dryer. I assure you that the linens were clean. As clearly stated in the welcome letter emailed to you with your check in details, all tenants have different preferences for the setup of the house - twin or king/doubled beds. We do not make beds in an effort to ensure that the tenant can decide how to set the rooms up for their group. Ample linens are provided. This way we conserve water by not washing clean linens. Amazing place, perfect location, great host!! Aimee was incredibly prompt in every interaction we had, very friendly and sweet and the houses had everything we could have hoped for and more! We rented her two houses next to each other for wedding guests over Memorial Day Weekend and it exceeded our expectations. Lots of sleeping room, living area for everyone to relax close to the open kitchen, tons of glassware and kitchen stuff...it really was the perfect setup. And the pricing for the area is unbeatable! My family raved about the places at the time, and haven't stopped since. We absolutely will use Aimee and these properties next time we can make it to Newport!! This house has everything you could need for an amazing family vacation or girls weekend. It is so close to the beach, great seafood and local watering holes. Myself and everyone who stayed would recommend to anyone wanting to be in the Newport area. The owner was attentive, timely and accommodating. You can tell the home is loved by the owner and all who have stayed there. I can't wait for another opportunity to come back! For visitors looking to take a bit of Newport style home with them, the city’s quaint wharves and cobblestone streets are a mix of unique shops and galleries. Complementing it all is a year-round calendar of special events ranging from nautical events to music festivals to professional sports tournaments.